The last time that a major British horror story was adapted from the stage, it was 2012’s The Woman in Black which, despite huge box office numbers (primarily due to the inclusion of Daniel Radcliffe, then just coming right off the end of the Harry Potter series), didn’t exactly prove to be anything more than just the standard amount of jump-scares you’d see in any standard horror movie – that, and also the sequel released in 2015 wasn’t very good, either. 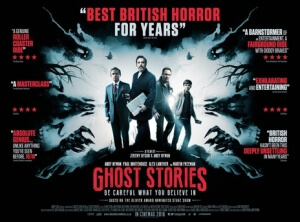 In the case of Ghost Stories, adapted by Jeremy Dyson and Andy Nyman from their successful stage play of the same name, it kind of plays with the jump-scares a little bit and has fun in how it not only homages some of the greatest in horror movie history, from Don’t Look Now to Halloween, but actually works really well as a genuinely unsettling and meticulously crafted horror film in its own right. As in the stage play, we follow Professor Phillip Goodman (Nyman), an investigator of paranormal activity – or, more specifically, he investigates how most of it is nothing more than a mere fraud, and that the supernatural is just one big con by people looking to make a quick buck. His cynicism, however, is tested when he is contacted by a reclusive former investigator (whose actor identity shall remain anonymous as it is a spoiler, though it probably won’t be too difficult for you to figure out who it is), who gives him three cases to solve. The first is of a night watchman (Paul Whitehouse) who has a spooky encounter during his shift at an abandoned woman’s mental institution; then, he visits a disturbed young man (Alex Lawther) who claims to have been in a hit-and-run incident with a demonic presence whilst driving his parents’ car; and finally, there’s a wealthy businessman (Martin Freeman) who was the recipient of a disturbing episode at home whilst waiting for his first child to be born. As he piles through case after case, Goodman comes to a horrifying realisation that not only could it be possible for the supernatural to exist, but it could have severe consequences for his own well-being. The play, rightfully so, apparently ends with an announcement asking the audience to “keep the secrets”, to prevent spoilers from ruining other people’s experience, especially with where it all leads to by the end. I myself shall also refrain from revealing too much, because Ghost Stories is one of those horror movies that you really need to see with a fresh pair of eyes. It takes turns that are shocking, unpredictable, and most of all frightening, which is mostly down to how both Dyson and Nyman have approached this adaptation with a serious love for horror movies in general, and have set out to make a film that calls back to the moody atmospheres and unsettling tone of past classics as closely as possible. It’s very clever how it incorporates all the things you would see in a typical horror movie – dark rooms, invasive camera angles, sudden jolts on the soundtrack whenever something scary pops up on screen – and both plays them straight and also pokes light fun at them, an indication that they know you’ve seen these kind of scares before, but want to remind you of how enjoyable they can still be. Even as the movie takes a very surreal turn in the third act, almost into David Lynch territory, by that point you’re more than accepting of the strange world they have created, and are open to just how much more disturbing it can get, right up to a final conclusion that’s as chilling as they come. I admired how the movie both looks and acts like if it were made when the likes of John Carpenter, Tobe Hooper or William Friedkin were at the height of their powers, from the drab and almost soulless English backdrops – an eerily empty pub and a cloudy seaside backdrop being among them; seriously, I don’t think there’s a sunny sky at all in this movie – to the genuinely terrified performances of the actors, particularly Alex Lawther whose bug-eyed facial expressions are so manic and clearly disturbed they’re just about as scary as the very thing he encounters in his own story. The way it’s shot, lit, directed etc, you could tell people that this was a lost film made in the late 1970s and they’d be justified in believing you; it harkens back to an old age of horror filmmaking that you rarely see anymore, one that’s unquestionably more character-based and takes time to establish each major scare instead of throwing them all at you in one go. The passion by these directors is so evident that you’re blown away by how much care and thought they have put into making their little horror film work, instead of taking the easy route and just have it be a collection of mere jump-scares and nothing else. With horror being a largely revitalised genre of filmmaking over the past few years, in that more and more filmmakers are actually making an effort to make them good, films like Ghost Stories, as well as other recent ones like Get Out, The Babadook, It and several further strong movies, are a vast and solid reminder that, in the shadow of cynical and poorly-made scare-fests like The Bye Bye Man and The Gallows, horror is still a genre to be reckoned with. Not everyone will find them appealing, and I suspect there will be a small number of people who don’t see this movie as particularly scary, but the sheer effort in filmmaking, writing, acting, production design etc makes all the difference in the ongoing struggle to get horror movies to be taken as seriously as the most critically-acclaimed drama. Luckily, Ghost Stories can be described as exactly that. Ghost Stories is a highly entertaining and effortlessly effective horror movie that takes many of the elements one would find in a standard horror film and pays loving homage to them whilst also working well as its own entity, making it a fiercely spooky movie to watch with excellent craftsmanship both in front of and behind the camera.